Hope everyone is having a great holiday weekend. We are spending it at home. Some of you know that Sam had somehow gotten a infection at the nail base on one of his fingers. He came to me 2 weeks ago and showed me his finger it was not really bad at all it looked it does when you get a splinter and don't know it and then it kind of swells up and has a little white pus. He said it has started 2 days earlier on Monday. I cleaned the area, popped it and all looked good. I had him put meds on it every few hours. The next morning it looked worse. Then Friday even worse. Saturday his finger was swollen, red, the original little hole that was there looked like it had exploded and now it had a huge hole and all the tissue hanging out. He went to the Med X. They did xrays, lanced the finger, gave a prescription for antibiotic and told him he need to see a hand surgeon that the infection had made it to the bone. Monday a hand surgeon called and told him to come in on Tuesday. He went, they lanced the finger down both side, across the tip and across the top right under the exploded area. They then treated it with Silver Nitrate to start the removal of all the tissue that had protruded outwards. Now his finger is cut all up, has the huge whole, very red in areas and black where the tissue is being treated. If the antibiotic and silver nitrate works all we be good. Just a few months for it all to heal. If not they will be removing that finger. Needless to say this has been a very hard week for him thus being one for me as well. He will find out Tuesday what road is next for him. So if you are someone who prays I would appreciate you adding my baby to your prayer list. Now onto the post for today. 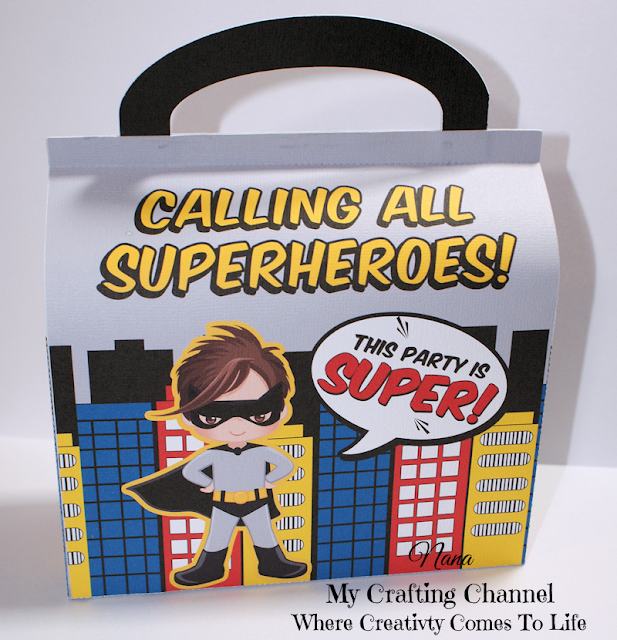 I created these a few weeks ago and just getting around to posting them. I love the images and really love that they come in both sexes and different races. These HUGE treat boxes are like the Girl Ladybug treat box I posted HERE. My heart goes out to you Nana...praying Sam gets better real soon. 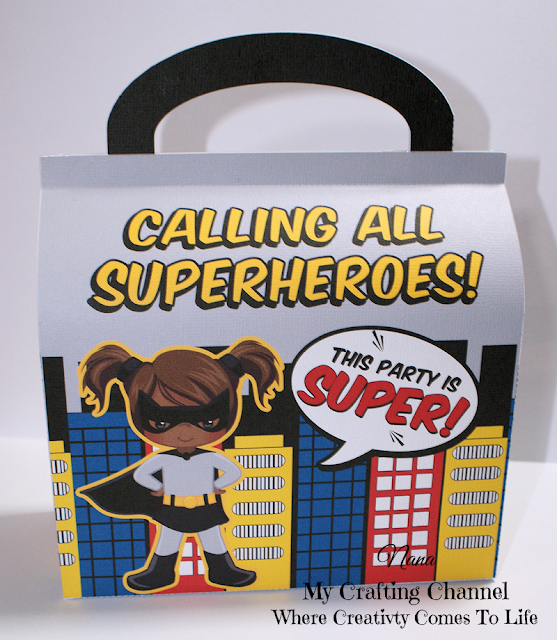 Such fun treat boxes. 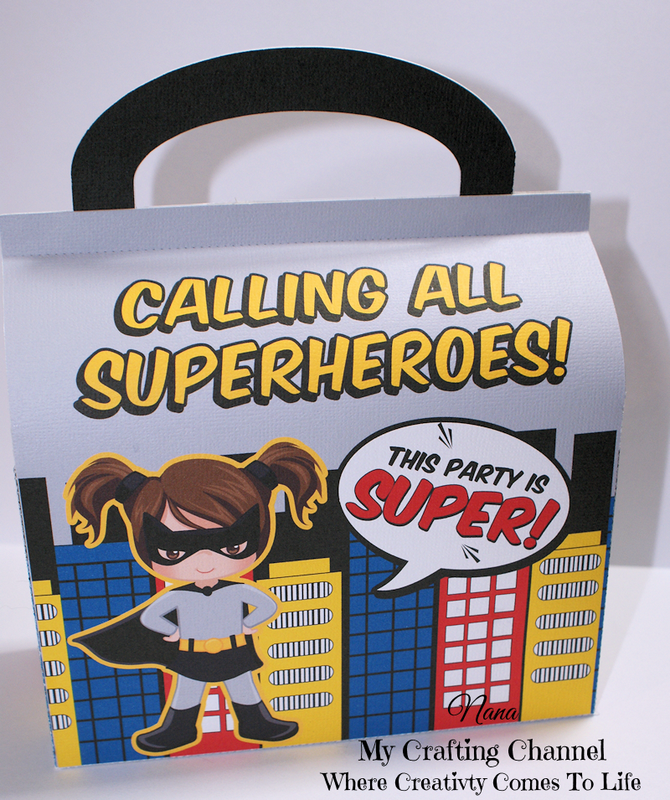 Every super hero needs one! P.S. Sorry to hear about Sam. Sending my prayers, hugs and love to both!! Oh my word, poor Sam! I hope that finger heals up quickly, it sounds painful. I am loving your super hero boxes! 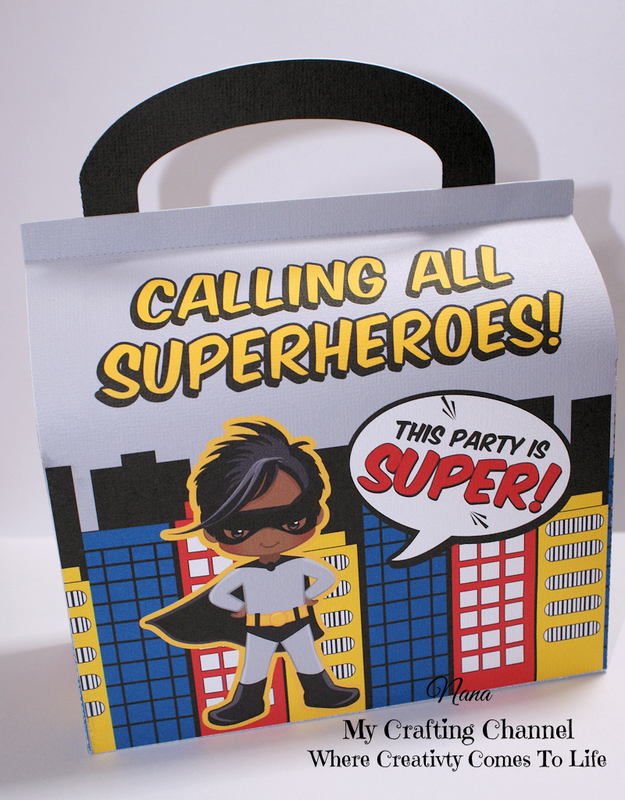 They are just cute as can be and would be perfect for any superhero's birthday party! So sorry to hear about Sam, I hope he is on the mend, it sounds like quite an ordeal that he went through. Also, Happy Anniversary to you, hope you are enjoying your special day! Adorable treat boxes, loving the super hero them! Sending prayers Sam's way! I know when we talked on the phone you were worried but seemed positive!Have you had to hit him in the head anymore? I'm sure after this he won't bite his nails again! I hope Sam has good news tomorrow! Happy Anniversary to you both! 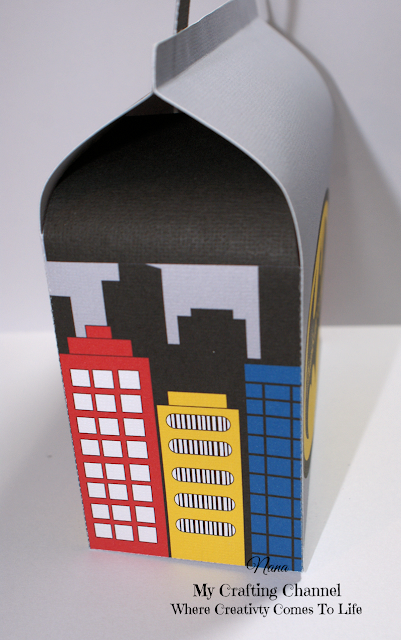 Your treat boxes are so cute, love that the buildings wrap around the sides. Aaaaw, So sorry to hear about Sam! Sending prayers...omg, that sounds painful! Happy Anniversary to both of you~hope you have a great day! I love your sweet boxes..so fun and perfect for a childs birthday! 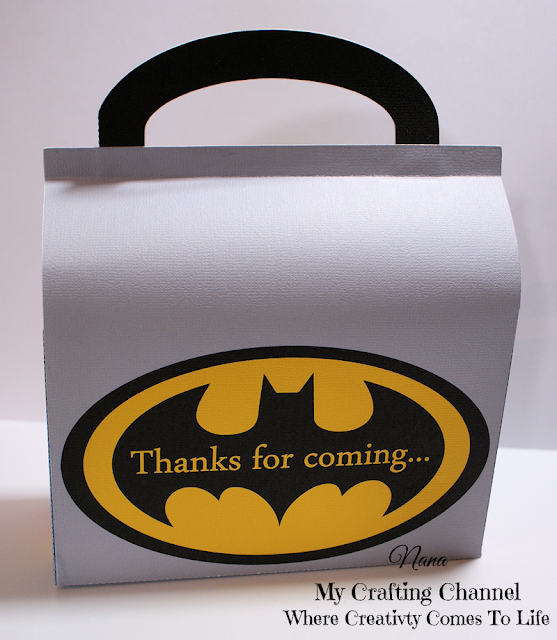 Awesome treat boxes! Sorry to hear about Sam, hope all went well!